What oil to put in my car, choose the right oil with this free app Which Oil? 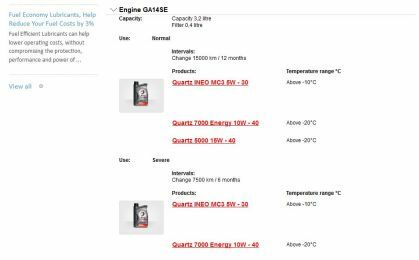 After reading our ‘What Engine Oil Does’ blog, you should now understand the differences in engine oil’s available and the importance of choosing the correct oil for your engine. For those who choose TOTAL oil as the brand they trust to provide them with their lubricant needs, we have a helpful App to help you find the right oil grade you need. 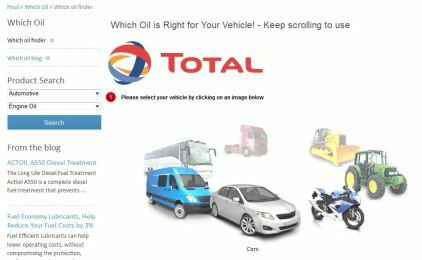 Our Which Oil App can tell you what oil you need for Cars, Bikes, Tractors, Diggers, Trucks, Buses & Vans and has a large database of makes and models in these sectors. Whilst most Oil brands now offer similar apps on their website, we are proud to say that Finol is the only oil company that offers a handy look up option on our App for the Irish market, where you just have to put your vehicle’s number plate into the app and it will return the results for your vehicle. To help you use our Which Oil App more efficiently we have posted this blog with the following guide to using the App. This is a video guide to using the App or you can read a step by step guide below. Step 1. 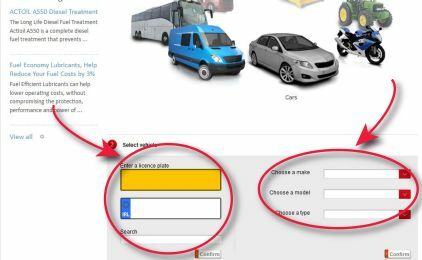 After navigating to our website, you need to choose the ‘Which Oil’ tab, highlighted in yellow on the right-hand side of the page. Step 2. Upon clicking on the link you will be brought to the Which Oil App page, to view the App you need to scroll down slightly. (As in the image below) You can then hover your mouse over the App and the images will spin, choose the image that applies to the vehicle you are looking up. For the purpose of guiding you how to use the Which Oil App to look up what oil you need, I am now going to take you through both methods separately. 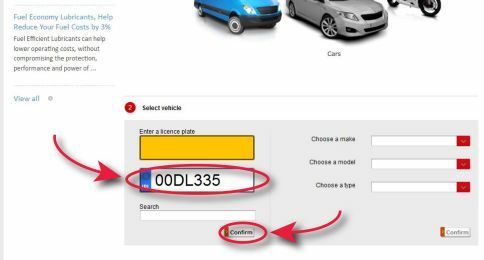 Firstly we will look at looking up your vehicle using the reg look up, then we will go back to this stage and look at looking up what oil you need using the make and model search. Step 5. After entering your licence plate, you will be shown your vehicle like in the image below, or sometimes you may be given the option of various models of your vehicle. Click on your vehicle and then click Confirm. Step 5. Click on the drop down arrow beside ‘Choose a model’, you will then need to scroll down slightly again to see the options of models. Choose the model and year that applies to your vehicle/engine. Step 6. Click on the drop down arrow beside ‘Choose a type’, again scroll down slightly to view the options of engine sizes and types. Choose your type of engine and click on it. Upon doing this you will be brought to the same page in step 6 above giving you the choice of recommended products. You can then follow step 7 above to find out more information on the product recommended for you. For more information on the product recommended to you for use you can also contact Finol directly or view our product focus blogs every Friday to see a review of our products, if your product hasn’t been reviewed yet, leave a comment on our blogs or our social media pages to request a particular product review.